Ashampoo Burning Studio 2013 has been one of the most popular disc burning software application for Windows operating system that that includes many tools, which you can use to burn optical discs, or to create data backups and images. Ashampoo Burning Studio 2013 is the upgrade version of Ashampoo Burning Studio 2012, where both is able to backup or burn files to Blu-ray, DVD or CD, and also to author and create slideshow and video discs. Ashampoo Burning Studio supports more than 30 languages including Portuguese, Czech, Danish, German, and etc. with latest update or redesigned, Ashampoo Burning Studio 2013 now can build and burn Blu-ray HD and Full HD video discs and then the output can directly to disc or to a folder. Once finished install, follow the instructions in the software. Note: For easily grab the serial key code, sign in or login in to the account and leave a comment, the supports team will reply with serial code. 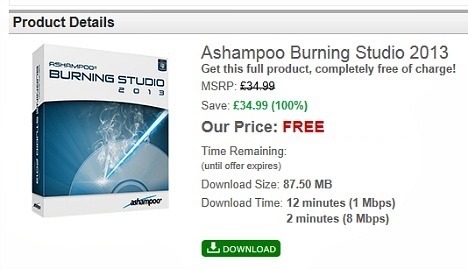 Ashampoo Burning Studio 2013 compatible with Windows XP, Vista (32bit & 64bit), Windows 7 (32bit & 64bit), and Windows 8.